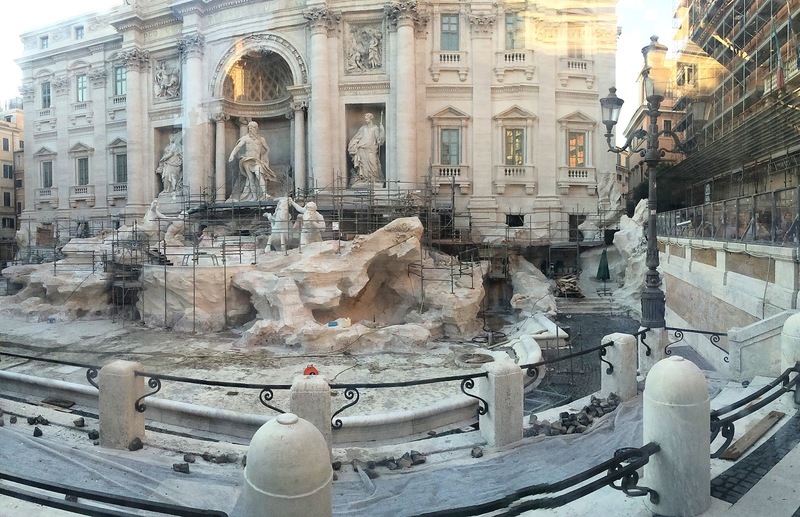 I had read lots about the Trevi Fountain (Fontana Di Trevi) before flying out to Rome and I did spot reviews on Trip Advisor where travellers had mentioned that the fountain had been drained for restoration works. This seemed to have slipped my mind when scouring the area for the fountain and when we arrived, we were greeted with fencing all around the fountain and crowds of tourists taking photos from behind the glass that surrounded it. In all honesty, even though the Trevi Fountain wasn't gushing water, in all its prime, I was still so overwhelmed to have been able to pay a visit and it was one of the most memorable parts of our trip as we didn't think we were going to be able to see it before jetting off back home. Albeit, we didn't get to throw in a euro over our shoulders and make a wish, but it was still equally as meaningful to me. Hey, maybe in years to come I will get to have the whole 'Lizzie Mcguire' moment and pay a visit to the fountain again when it reopens. But, for the time being, I am just so happy to have been able to marvel at the architecture and cross this off my Rome bucket list. There is still a very small enclosure (a trough-like enclosure) which you can throw your money into over your shoulder until the restorations works are completed, but it just does not have the same effect as throwing it into the fountain. Whatever happens, I'm sure that I will defy the odds and return to Rome someday. If you are planning on paying a visit, I'd strongly recommend searching online to see if it is up and running again ready for your trip as websites are rumouring that it will be reopening in November this year. In the meantime, there is a live webcam, here, showing the Trevi Fountain and it's surroundings which is well worth taking a look. I'll admit, I've been watching it this morning and I'm slightly envious of the sunshine. Have you ever visited the Trevi Fountain? What were your thoughts? I'm so happy you liked Rome and the Fontana di trevi, I love when someone appreciates my beautiful country! Unfortunately we Italians most of the time don't totally understand how lucky are to own all these beautiful monuments!